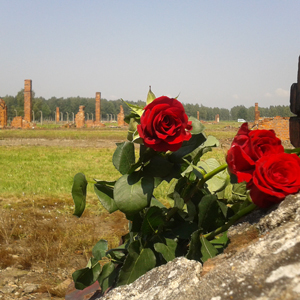 The anniversaries of world-shaking events have come thick and fast this month, but one has been largely overlooked – on the night of August 2–3, 70 years ago, the Nazis executed every last remaining Roma in the so-called Gypsy family camp at Auschwitz-Birkenau. To mark this occasion, almost 1,000 young Roma and non-Roma came to Poland from more than 20 countries to take part in a commemoration ceremony at the former camp. The event was organised by the International Roma Youth Network (TernYpe) and began on July 31. It consisted of three days of workshops, conferences and survivor testimonies about the Roma genocide – often referred to as a forgotten Holocaust among the Roma people. Sunday August 3, will see a closing ceremony on Błonia, from 6pm. Concerts and dancing, open to all, will continue late into the evening in celebration of the continuation of Roma culture, and also in memory of the past. Between 200,000 and 1,500,000 Roma were murdered by the Nazis during World War II. in other news, between 0 and infinity of Poles were murdered by non Poles yesterday. Still at it, Max – sorry – Kurt? I’ll give you ten out of ten for persistence. 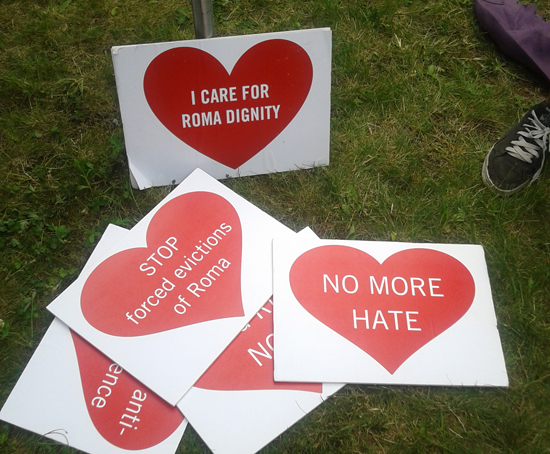 “i care for Roma dignity” – ? what does that even mean? “stop forced evictions” – 8/10 for triteness – are there voluntary ones? “no more hate” – 10/10 for triteness – Boko Haram are pissin’ in their pants. obviously the Roma deserve their own homeland as a means of controlling crimes against them – I suggest somewhere in northern Syria with a tinge of Kurdistan and Turkey – the area seems available these days for anyone who wants to grab it so properly motivated Roma should have no problem asserting themselves in their ancestral homeland. Perhaps they can take Aussenminister Sikorski & Innenminister Sienkiewitz with them as those two are likely to be out of a job soon. ps @ Rubin: I am assuming that only the owners’ of this site (& max) post here – a self-adulation society? suggest closing all comments. “I am Scottish. I am 6′ 6″. I have studied 4 different martial arts. I am beautifully handsome, I am intelligent. I am rich. I am modest. I have a great sense of humour. I am sensitive to the feelings, thoughts and beliefs of others. I take it you need to know no more about me Voytek… In response to that ridiculous comment I leave you with the words of a great Russian general, “A pole is a rat that fights like a mouse”. Do the owners of the site here continue to state, contary to all evidence, that they are not virulently antipolonic? Regarding the comment above, it seems to me, that it is in clear violation of some Polish laws regaring incitement to hatred on the basis of ethnicity (in this case either against Poles or against Russians depending how you view it) – I believe also that a foreigner living in Poland even if an EU national can be sent packing for making such statements (after a just prison sentence, of course). also, the problem with being so much better than everybody else is that some people might think you are pretentious. I don’t disagree about the Russian general quote – (which Russian general? I’ve never heard that quote), – but a certain Max Bobrowski did his fair share of disparaging people on the basis of their ethnicity (“non-Poles”, “people who refuse to assimilate”, “blood in the streets”, etc) Wouldn’t you agree that his xenophobic attitude gives ordinary Poles a bad name? Or am I asking you to put your head in the stocks while I hurl a rotten cabbage and several ripe tomatoes w twoim kierunku? And what’s with the German names all of a sudden? Schnauzer, Kurt…. is calling a non-Pole a non-Pole disparaging? Is that because you think Poles are better than other people? And how is that disparaging on the basis of ethnicity? In fact, it seems to leave out the person’s ethnicity altogether – just stating that that is not a Pole. “I don’t disagree about the Russian general quote” – about what was said about that quote or about the substance of the quote? Specify please. so 1) we have more threats of violence and 2) continued denial of anti-polonism on this website. Either Poles ARE a distinct ethnicity in which case talking about non-Poles could, in some cases, be seen as discriminating on the basis of ethnicity but labeling a non-Pole, “a non-Pole”, by definition, cannot be discriminatory – it would be just a statement of fact. Or Poles are NOT a distinct ethnicity, in which case talking about non-Poles is as meaningless as talking about Poles and cannot again, by definition, be discriminatory. So which would you like? Take your time and check with the Guardian manual. Thank you for your unintelligible comments. I will take it that you, Schnauzer, Kurt, Max Bobrowski, Anatol Karp, etc, etc, are all one and the same person. Please correct me if I’m wrong. Napisz cos po Polsku inaczej nie uwierze ze jestes Polakiem. W ktorym wypadku, dlaczego zgrywasz Polaka? Checkmate AGAIN, Max. You don’t learn, do you? Agree 100%! – this is true for EACH of your posts. According to some bad comments on the Holocaust here, it seems that many Poles forgotten that bad things come from totalitarian regimes, including the Stalin’s USSR that the Poles ‘enjoyed’ some half a century. Related to that, and regardless the genocide is connected to the Jews, Gypsies, or Poles, it is for sure that the Putin’s Russia did not learn the lessons from the past when it comes to the war in Ukraine, treatment to Poland and other EU members after the sanctions, etc. We can only hope that totalitarian regimes must not be supported nor encouraged by any civilized country. Croatia strongly supports the sanctions against Russia. On the other side, I have a friend in Serbia and she told me that her country supports Mr Putin and his bad behavior in Ukraine. It is very unclear why Serbia, a candidate for the EU membership, supports Putin’s invasion to Ukraine’s territory. I asked my friend to investigate the situation because she is a sociologist, and she responded by claiming that Serbian intelligence units are involved into Ukraine conflict. In fact, the Serbian secret agency apparatus recruits fighters for pro-Russian insurgents, in the close collaboration with Putin’s KGB-FSB-whatsoever. Interestingly, one of the Serbian commanders within the pro-Putin forces in Ukraine is Dragoslav Bokan, the long-term collaborator and special agent of Serbian KGB, as well as the former founder of “White Eagles” – the Serbian paramilitary force in Bosnia and Croatia who performed terrible crimes during the nineties. For the Poles who might not know, Serbian and Russian intelligence closely coordinate their activities related to making troubles not only in Ukraine, but also in the EU member states. Just ask yourself why so many narcotics travel to the western Europe by Russian and/or Serbian drug routes. Ask yourself why Moscow is so similar with Tehran when it comes to the increasing number of drug addicts. It is obvious that oppressive countries such as post-communist Russia and Serbia, as well as their good friends in Iran and Afghanistan, are quite good ‘brothers’ when it comes to feeding the West with heroin. Maybe the good option would be to ban all Russian politicians and their families to enter democratized EU countries for some 5 years. Probably they would become more smart and disregard Putin and his camaraderie. Poland knows very well who the Russians are, so it did not think a minute before asking for NATO and EU membership. The same for Croatia and other post-communist countries. Only God knows what is going on with the Serbs. They seem likely to repeat their own mistakes from the past. Now the all world knows that they support Putin, but not what triggered that abnormal support.